If you read don’t already read Anna‘s blog and have any interest in worldwide Christmas traditions, I’d suggest you check out her great recent posts on Russian holiday celebrations. I’ve been following them with fascination because it gave me a glimpse into many of the origins of Mongolian Шинэ Жил (shine jil, literally new year) traditions. When I told her that Mongolians had lifted many of the holiday trappings directly from the Soviets, she said she’d like to hear about them. I will write a post on the subject, but it’s going to have to wait until Russian Christmas or so, since my own New Year’s plans have gotten in the way. Around noon yesterday, I found myself sitting in a coffee shop and considering my NYE prospects. As I grew up in the WASP-y (well, mostly Jewish, so WASJ-y?) upper middle class sort of suburb that offers twenty-somethings neither opportunities to socialize nor affordable housing, most of my high school friends have vacated the premises. Most of those who do reside either in the surrounding suburbs or down in the city itself all have significant others, and I was less than thrilled at the prospect of being the only one at the party with no one to kiss when the ball drops at midnight. I have dance friends in Chicago, but most of them are in South Carolina for Lindy Focus, a dance extravaganza I lack the income to attend. So, completely on a whim, I decided to join the college friends convening near Akron, Ohio for the holiday. I hoped on the internet, bought myself a bus ticket, and called the appropriate friends to arrange pickups. Less than 24 hours later, I was on the train, and an hour after that, I was on the bus. I do regret missing my brother’s last day before he returns to his post in Okinawa, but let’s face it – there are other people with whom he’d rather spend this holiday. It’s an eight-hour bus ride, but the roads are paved and the bus has a bathroom and electrical outlets and even wifi. Public transit in the US has got nothing on Europe, I know, but it’s a far sight nicer than Mongolia. I’m visiting a city 400 miles away, hanging out with friends I haven’t seen in a year and a half, for half the cost of gas. Sounds like a good deal to me! But I didn’t bring my computer and don’t much fancy trying to format posts with pictures from my phone, so the Шинэ Жил post shall be postponed. In the meantime, here’s me wishing you a safe and happy new year! Шинэ жилийн мэнд хургэе! Categories: Stateside, Travel | Tags: Murica, public transit, travel | Permalink. Today I had an argument with myself over how to wear my hair to church for Christmas Eve. I got a keratin treatment yesterday because it helps to strengthen and detangle my otherwise brittle and knot-prone hair. It’s something they have to flatiron in, and so yesterday (and today, because I haven’t washed it yet), my hair is straight for the fourth time in my life. That makes it very much a novelty, so on the one hand, I might as well leave it that way for church tonight. Plus it’s better to let the keratin set for two days before you wash it. The comment I got most often at my school’s New Year’s party last year was, “Why aren’t you wearing makeup?” It wasn’t enough that I had taken my director up on her gracious offer to let me borrow a dress, and to get my hair curled; without full-out face paint, I merited only comments on the insufficiencies of my appearance. Needless to say, I did not have much fun at that party. I don’t want to spend Christmas Eve being made to feel (even unintentionally) like I owe it to the world to change what I look like in order to make other people happy, or that it’s absurd for me to actually like how I look. Frustration and resentment are not conducive to the Christmas spirit. /rant. Maybe now that it’s out there, I can actually get on with the business of cleaning the house and preparing for the holiday. Merry Christmas from my family, including me in my natural curly-haired state. Categories: Life in Mongolia | Tags: appearance, catharsis, Christmas, feminist rant, self-image | Permalink. So What Do I Call You Now? Adulthood is a pesky thing. It keeps rearing up when I least expect it, reminding me that the rules by which I have always abided (why do we say “abided” here, and not “abode?”) have changed; I cannot do things as I have always done them. Responsibility, which I have never feared, suddenly carries real-world repercussions that affect more than just me, and suddenly I occupy a different place in the world. A lot of this was true in Mongolia, of course, but some of it hits me afresh now that I’ve returned to America, specifically the issue of names. There are an awful lot of people I originally knew as Mr./Ms./Dr. [last name] because I was a child, or a student. But now I’m neither, and that muddies the waters a bit. How does one address a former teacher/professor? A former scout leader? A former boss who also attends my church? My parents’ friends, who I’ve always sort-of-but-not-really known? Some of these folks make it easy for me. The scout leader addresses me by last name unless I address her by first name; several of my teachers/professors always asked me to call them by their first names, or have told me since graduating that I can do so. But then there’s the former-boss-who-attends-my church. I knew him first as an adult at church, so I called him Mr. B. But then I started working for him, and I couldn’t call everyone else at the office by their first names and not him. But then, it didn’t seem right to call him by his first name at church, either. So I referred to him by his first name at work and his last name at church and just tried to avoid addressing him by name altogether. For that matter, I still do, even though I no longer work for him. And what are you supposed to do about professors with doctorates who sign their emails with their first names, or their initials, but never actually address the issue of address? My general policy is to call those with doctorates by their titles unless and until I’m specifically asked to do otherwise, but those signatures add just enough ambiguity to the situation to make me antsy. If you don’t want me to call you by name, why are you signing your emails to me with it? But if you want me to call you by name, why haven’t you asked me to? Mongolia brought a welcome reprieve from the business of titles. No one there calls anyone Mr. or Mrs. anything, probably because there is no single system of last names. Mongolians don’t usually have single surnames that are passed along the generations; instead, most of them have adopted the Russian patronymic system. Thus, each child bears the name of his or her father – sometimes with the genitive suffix appended, and sometimes not. That’s already a lot of mosts and sometimeses: a Mongolian’s “surname” could be 1) a Russian-style patronymic, with the genitive suffix; 2) a patronymic without the suffix; 3) a Western-style family name. To further confuse matters, they also reverse the familiar Western order of the names so that the patronymic (or surname) comes first, much like the Chinese family name. Mongolian names in intra-national contexts are always listed this way. But throw a Western country with a different name order into the mix, and it’s a bit of a toss-up as to which will be used. Just writing your name on an official form becomes a headache, lest you accidentally switch the boxes for your “first” and “last” names. Even finding people on Facebook is tricky, since some list their names in Western order, and some in Eastern. And yet, I said this was simpler to navigate? If you were actually talking to the person, it was indeed. If you look at a Mongolian business card, you’ll find it very easy to tell which name to use when addressing the person to whom it belongs: it’s in all caps. Thus, my name (transcribed phonetically) would read Бурк КЭЙТЛИН; my coworker’s, Доржсүрэн ҮҮРЦАЙХ. The given name has precedence, and it’s what everyone calls you. Indeed, sometimes they don’t even bother to list the family name/surname/patronymic – just the initial. I have no idea what my coworkers’ last names were because on every roster I ever saw, their names were just listed as Ц. Лхагва or Г. Эрдэнэсувд. “What?” you ask, “students call their teachers by first name?” Well, sort of. Often they add the word teacher (багш/bagsh, plus a vocative aa) to the end of the teacher’s name – or they just call the teacher teacher. Thus, my students called me Katya-bagshaa or just bagshaa. I called my students, coworkers, and superiors alike by their first names, and my coworkers called me Katya unless I was actively teaching them (in which case they too called me Katya-bagshaa). It was all wonderfully simple and uniform. Now, alas, I’m back to wondering what I’m supposed to call people, especially the ones I now know in different contexts. I just wrote an entire post about how much I dislike being called by unsanctioned nicknames, which is all part of the same topic. I wouldn’t want to cause the same distress to someone else through a similar instance of over-familiarity. Just tell me what you want to be called, alright? Less ambiguity, less stress all around. Categories: Cultural Notes, Life in Mongolia, Stateside | Tags: adulthood, culture, family names, I'm a grown-up now?, Mongolia, names, patronymics, terms of address, the Soviets were here | Permalink. At long last, the sky began to grey, and then to brighten, and though the trees and mountains blocked direct light as well as any view of the sunrise, we were all awake by dawn. We ate the last of our food and sipped at our precious water reserves, wishing desperately for coffee or hot chocolate, something to banish the chill from our bones. As we extinguished the last of our fire with yet another chunk of moss, I smiled wryly at the other girls. “Well, I hadn’t expected to teach Wilderness Survival Merit Badge on this hike,” I said, eyeing our shelter through the final wisps of smoke, “but congratulations. You all pass.” They chuckled and finished got to their feet, donning their packs. We weren’t out of the woods yet, literally or figuratively, but we’d made it through the night. Now we had to get home. Unfortunately, getting home was not going to be easy. Though we set off chilled and aching, we hadn’t been walking long before we started stripping off our extra layers as we clambered through field after field of boulders. Dehydrated as we were, and without enough water to remedy the problem, we overheated quickly and stayed that way. The exhaustion of the previous day’s hike and general lack of sleep had taken its toll as well, and our progress toward the distant city we caught in tantalizing glimpses was slow. But we were making progress, at least, and so we trudged onward, making our careful way downhill. As usual, I’d fallen behind the others during this downhill stretch, and so at first I didn’t see anything different about their having stopped ahead of me; it just looked like another break. But as I approached, the depressing truth appeared: though compass and city lights told us to keep marching forward, we’d have to disregard their beckoning and turn aside. We’d trudged straight into a barbed-wire fence. RESTRICTED AREA – DO NOT ENTER, declared the signs posted at regular intervals. Moreover, they said so in English as well as Mongolian, which I found entertaining; very few signs in this country boasted translations. Why bother here, when the barbed wire shouted stay out in a universal language? Having made extensive use of our guidebooks, we knew where we were now, and it was not where we wanted to be. Be careful not to drop too soon or you’ll end up at Ikh Tenger, one valley short of Zaisan. Ikh Tenger is where the president lives with machine gun-wielding guards, who will be none to pleased if you drop by unannounced. If you see a barbed-wire fence you are in Ikh Tenger; to get out, just continue west along the fence and over the next ridge. So we did as the book advised: we turned left and tried our best to follow the fence west. Alas, it mostly didn’t go west – we were forced to backtrack as it turned ever more south, leading us up a ridge and through brambles tore at our hands and arms. We paused as we trudged through to strip them of raspberries and rose hips, exacting our small revenge. Up and back, up and back we climbed single file, warning the others as we encountered bad footing. Despite our care, Krysta and I both slipped and fell into rosebushes, while Valerie went sliding into a brush-filled hole. We took the setbacks as best we could, giggling at the falls and grateful that none of us sustained injury. At last, we were able to continue northward along the side of the ridge the fence has led us to. Abruptly, we found ourselves out of the woods and in the merciless sun. This ridge was desert-like, covered in gravel and larger stones – the kind of surface that sends you sliding back a step and a half for every two you try to take uphill, or jerks your feet out from under you altogether when you’re waking your way down. We considered our options: up, down, or across? I left the others to make my slow way uphill, but when the long journey up a hundred feet left me far from the top, we decided to try our luck amongst the forested base of the ridge. We could make our way between ridge and woods, we figured, at the border where the brush wasn’t too thick. We seemed to be in luck. Upon reaching the base of the ridge, we found ourselves upon a path – a path! – that followed a little stream. The barbed wire appeared to have receded back into the woods; there was none in sight, but visibility into the thick tangle was limited. As we followed the path, a ger appeared before us, bringing smiles to our tired faces. At long last, we were nearing civilization. But as we approached, Ginny noted that it was an awfully nice-looking ger – nicer than you’d expect from a family squatting near the presidential compound. As the ground before us cleared, we found that it had been erected, not on grass, but on astroturf, which I’d seen only once or twice in this country. Sensing that, despite our best intentions, we had found ourselves somewhere we were not supposed to be, we made to turn back to the ridge. And that was when we saw the man with machine gun. He’d been walking at an angle to us originally, following a path we couldn’t see, but he stopped when the five of us caught his eye. He looked at us, and we looked at him, and when he started in our direction, the five of us walked to meet him without a word. What else could we do? You don’t run from men with machine guns. In our limited Mongolian, we apologized. “Passport?” he demanded, though of course none of us had them. I handed over my photocopy, and the others driver’s license or student IDs. He radioed a partner and led us away – where, we didn’t know. He asked if we spoke Mongolian, and I answered, “a little.” But that was the end of the conversation. No questions, no explanations. But at least we weren’t made to enter any of the buildings we past, some of which had no windows. As we walked, I tried to prepare an explanation despite not knowing any of the key words – hike, trail, lost. The best I could come up with was something like, Yesterday we went to Zun Mod. We saw monastery and then wanted to walk to UB. We saw road and walked and then didn’t see road. So we slept outside. Today we walked to here. We want to go to UB. The second guard considered the card and held onto it, leading us to building alongside the main gate. He entered and told us to wait outside, so we took seats along the curb. There was the road to the city – just a few feet away, but separated from us by a tall, spiked fence. Unlike the pack of stray dogs that raced by, we could not simply slip between the black bars that stood between us and our destination. Finally, they led us into a room with a single couch and told us to sit. It was a tight squeeze for the five of us, but we sank into it gratefully. More waiting ensued. It had been at least an hour since we’d stumbled into the compound, and who knew how many more would pass before we’d be allowed to leave it. My ringtone broke the silence. “Hey, what’s up?” my friend asked when I picked up the phone. “What the F**K, Katelin!” she shouted in my ear. Another phone rang shortly thereafter. 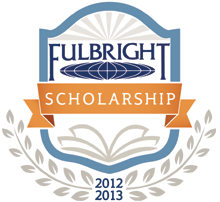 We all exchanged nervous glances when the name came up – it was the Public Affairs Officer for the US Embassy. Finally, Alisa volunteered to take the call. More explanations of where we were and how we’d gotten there, peppered with frequent apologies. We’d received a call from the Duty Officer night before and had been dismayed that our friends in UB had thought it necessary to call the Embassy; it seemed like overkill. Now, however, we were glad that our friends there had been apprise of our trip and surprise overnight, as it helped them to explain our current predicament to the guards detaining us. We sat quietly for awhile more after Alisa had finished apologizing to the Embassy folks for the inconvenience we were causing them, but eventually, a guard came in to see us. He demanded our cameras and looked through them to make sure we hadn’t taken pictures of anything we weren’t supposed to. He also examined our bags, confiscating my pocket knife when he came across it at the bottom of mine. After another hour of waiting, the Duty Officer finally arrived to pick us up; we weren’t allowed to leave on our own. I asked if I could have my knife back, but was denied – apparently they’re not allowed in restricted areas. I was bitter at the loss; it was a good knife that had served me several years, and it wasn’t like I’d brought in a machete. But I tried to keep it in perspective as we climbed into the Duty Officer’s car and exited those dreadful gates, our adventure coming to a close at long last. No one had been killed or injured; though our hike had taken more than twice as long as the guidebook had indicated, we’d never gotten truly lost; despite wandering into truly forbidden ground, we hadn’t been arrested. Categories: Life in Mongolia | Tags: detained, hiking, Ikh Tenger, Mongolia, trespassing, Tuv, Ulaanbaatar | Permalink. 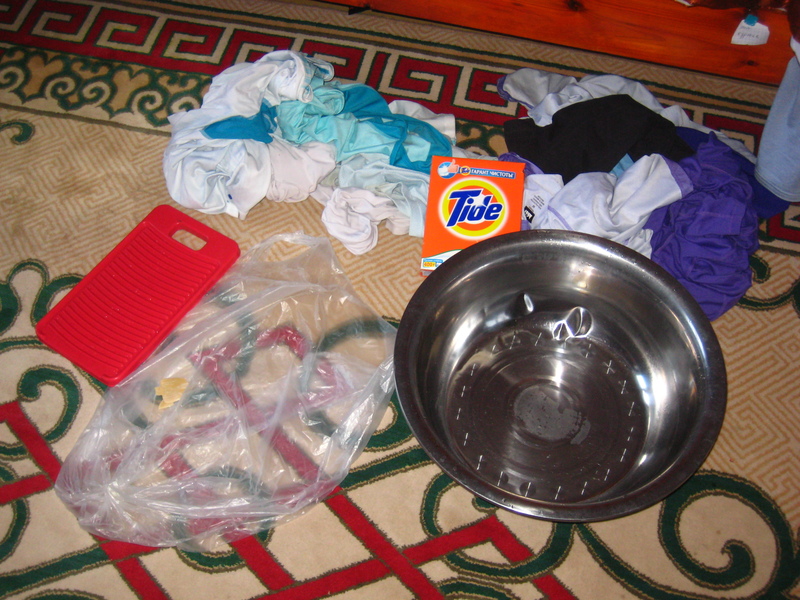 When my friend Corry studied in India, she had to ask her her host sister how to do laundry. “You don’t know how to wash your clothes?” the sister asked, bewildered. When Corry explained that in America we have machines that do the washing for us, her host sister was even more amazed. After doing my laundry by hand for over a year, I began to comprehend that feeling. Just think of all the things you can do while a machine washes your clothes for you! Mongolia is a little more advanced when it comes to time-saving gadgets. Washing machines are common in the big cities, and even out in the soums, they’re not unheard of. Most of them are manual: you’re the one who does the filling and the draining and the rinsing. All the machine really does is agitate your clothes. The attached dryer, if there is one, is little more than a centrifuge that spins most of the water out of your clothes. While we had such a machine in my apartment, I would classify it as mostly nonfunctional. It didn’t drain properly and always smells like mold, and my clothes often came out of it more worn and wet but no less dirty. The dryer didn’t spin at all unless you leaned most of your weight on the (broken) lid, and even then, it was too weak to handle a single wet sheet or towel. Even with lighter items, all it usually did was clunk about half-heartedly (and without appreciable results). So I didn’t use it. Bulky items like sheets, towels, and sweatshirts I schlepped to the homes of friends with functional machines, who were kind enough to let me use them. But everything else I did the old-fashioned way. Mostly, I didn’t mind, as long as I was good about doing the laundry regularly. I’m not saying I would have wanted to be a laundress (in the days when such people existed), but there’s something peaceful about staring into a bucket of suds. I would venture a guess that most Americans, excepting those who have gone on long camping trips, have never done laundry by hand. The process isn’t especially difficult, but it’s certainly time-consuming. Here are some tips on how best to accomplish it. 2. Use hot water. Hand-washing is not super-efficient, and it’s unlikely you’ll actually scrub most of whatever garment you’re washing. This means that you need hot water if you’re going to do any serious odor removal. Cold water doesn’t remove grease, either. So either pick a day when the hot water’s working or get that kettle going. 3. Everything your mother told you about sorting according to colors? I’m sure you all forgot it as soon as you got to college, relying on cold water and dye-absorbent sheets to keep everything from turning the same color as everything else. Well, dredge that knowledge up again, because it counts double here. Your clothes will leach out a truly amazing amount of dye, and the dirt… let’s not think about the dirt. 4. Reuse the wash water. Chances are, you can clean more clothes with it than you can manage at one time in a little tumpin. Just remember to wash your lightest clothes first, and your dirtiest clothes last. Told you they release a lot of dye! This is RINSE WATER – and this is the first garment it’s rinsed. 5. WASH YOUR SOCKS LAST. You will be disgusted at how much dirt they pick up. Unless you wear slippers, like the Mongolians; then they might not be quite so bad. 6. Handkerchiefs are unimaginably gross to hand-wash. Do not attempt without a washboard. Do not reuse the wash-water. 7. Baking soda is a surprisingly effective stain remover. 8. Wring out the soapy water before rinsing. You probably had to use a lot of soap to get the suds going, and it’ll take more water than you think to get it all out. 9. Wring as much water as possible out of cotton before hanging it to dry. Wet cotton stretches like you wouldn’t believe. 10. 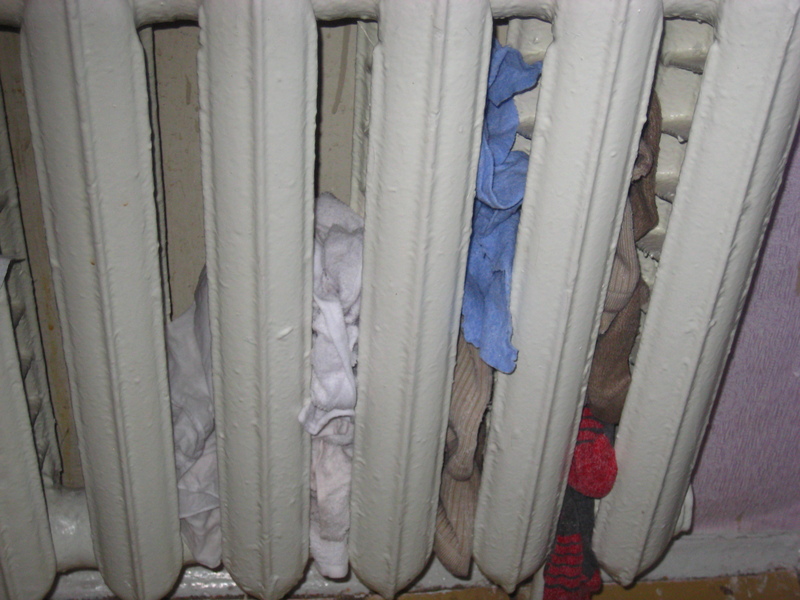 Stuff socks in the spaces of your radiator to make more efficient use of your precious drying space. 11. Wash right-side out; dry inside-out. The dirt’s on the outside, so that’s what you want to scrub, but if you’re drying clothes on old metal radiators, you want any rust stains incurred to be on the inside. 12. Do not forget your clothes on the laundry line, or it will rain and they will get wet and you will have to leave them out even longer. If you’re really unlucky, the wind will blow them off the line onto the filthy porch, and you’ll have to wash them all over again. 13. Laundry mountain is not fun to scale. By the time I’ve gotten one tumpin’s worth of laundry washed, rinsed, and hung to dry, my laundry zen is pretty much exhausted – as is the available space to hang my clothes to dry. So for most of my time in Mongolia, I did one “load” a day, 2-3 days per week. 14. You don’t have to wash your clothes as often as you think. A good airing-out (hung up, and not in an enclosed space like a closet) will remove most of the odor from clothes that aren’t sweat-soaked or spilled-upon. I re-wore most garments several times before washing them, especially work clothes, which I swapped out and hung up as soon as I got home. 15. Wool is your friend. It’s warm, it’s durable, and it’s remarkably odor-resistant. I have one yak-wool dress that I’ve owned for over a year and never washed. It’s not sweat-stained, and it doesn’t smell; why would I wash it? Makes you grateful for washing machines, don’t it? Categories: Life in Mongolia | Tags: how-to, laundry, life in the second world, Mongolia | Permalink. If you ask me what Mongolia was like, my answer will likely be flippant and short: “Cold.” Fifteen months’ worth of experiences cannot be condensed into a brief but all-encompassing summary with any degree of ease or accuracy, much less at the drop of hat. Thoughtful, targeted answers will be given only to those who ask thoughtful, targeted questions; all others will be met with the simplest, broadest truth I can muster. I’ve given this answer more times than I can count in the past few months, but now, as I find myself watching the swirling of our new-fallen snow, calling in to the local country station to share the craziest thing I’ve ever been stuck doing in the cold, and helping to move the drinks in from the screened porch to prevent a repeat of the Exploding Pop Incident of ’99, it occurs to me that I’ve never really addressed what “cold,” in the Mongolian context, means. I could tell you that a Mongolian winter means three solid months below freezing, bracketed on each end by two months of flirtation with the freezing point (better known as spring and fall). It means that there will be weeks in the heart of the season where you never once see temperatures above 0˚F. That none of my winter clothing was waterproof because there’s no such thing as slush or sleet in the middle of winter, when liquid water is a dream that exists only indoors. That at -22˚F (-30˚C), a cup of boiling water thrown into the air will disappear into a mist of snow and vapor. I could tell you that one of my friends in the hudoo made do without a refrigerator by storing milk on the windowsill and meat in a plastic bag dangled out the window, and that my ger-dwelling friends had to sleep with their computers inside their sleeping bags so they wouldn’t be damaged by the temperatures inside their homes. That on multiple occasions, I underestimated how long it would take me to run a few errands and wore only one pair of yak-wool socks inside my fur-lined boots, a mistake that meant a twenty-minute soak in warm water to return the circulation to my frozen feet. A painful twenty-minute soak. Moreover, I could tell you that all of this was true in an unusually warm winter, most of it in one of the warmest cities in the country. To my great disappointment, I never once saw -40, the temperature at which Fahrenheit and Celsius collide. Multi-day stretches in the negatives were not unusual though, and -35 was a familiar nighttime companion. That is what winter, what cold, in Mongolia means: the awareness that if you are not careful, the very air outside will kill you. Imagine that you are heading to work, a trip that takes 15 minutes on foot in the summer. But today the roads are icy, as they have been for the past two months, and you have no desire to find yourself sprawled on the frozen, unforgiving ground, so you give yourself 25 to make the journey. The stars have not yet faded from the still-dark sky, and the nearly-full moon reflects off the snow to illuminate the streets in an absurd contrast with the sky. The effect is one of high visibility within the impression of darkness, of a world that appears to have split itself in two, with only the stars and the moon-cast shadows defying the separation of dark and light. The sun will not rise until nearly 9 am for most of December and early January, with actual daylight holding out until almost 10. You step outside, and before you can gasp at the cold, your nostrils are assaulted by a curious prickling sensation as all your nose hairs freeze. The sudden exhalation, when it does come, condenses in the frigid air before you face to form a comically large and opaque cloud, and you wonder when you learned to breathe smoke and whether your new dragon-like abilities include heat. Your eyes begin to water, and you blink to clear them – but quickly, lest your eyelashes freeze together. You understand why the women at work wait to apply their mascara until after they’ve arrived at school. Within a few minutes, the exposed skin on your face begins to hurt, and the slightest breath of wind sends icy needles shooting into your flesh. Every inhalation sears the insides of your nose, your throat, your lungs. You can’t cover your nose without being blinded by the condensation that will freeze on your glasses, and your mouth goes dry after a minute of breathing through your mouth. Time slows down in this kind of cold; the space before you expands as your destination recedes before your watering eyes, and an eternity passes between each ragged breath. The ethereal landscape that so enthralled you blurs from focus. The fish-eye lens of extreme cold allows you to see only the path before you, to hear only the muffled crunch of your own footsteps in the hard-packed snow. Categories: Life in Mongolia | Tags: cold, Mongolia, weather, winter | Permalink.